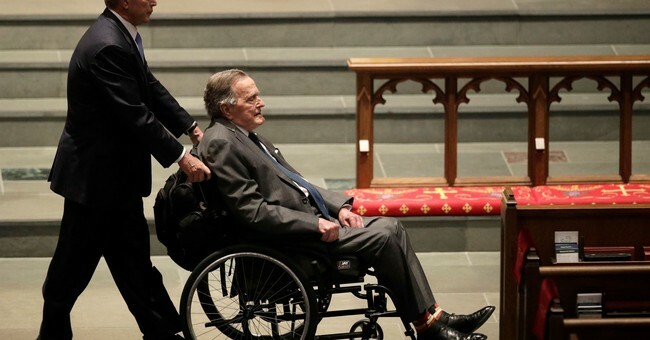 Baker, who called Bush his best friend, discussed his peaceful final day. "He had a very gentle and peaceful passing," Baker said. "They made arrangements for all of his children to call in to in effect tell him goodbye.In his last words, the last words George Bush ever said were I love you and he said those words to 43, his son former President George W. Bush, who had called in to say ‘Dad, I love you, I will see you on the other side, and President Bush said ‘I love you', and those were his last words…He had a very gentle and easy passing, the kind we ought to all hope we have." George Bush had been fading in the last few days. He had not gotten out of bed, he had stopped eating and he was mostly sleeping. For a man who had defied death multiple times over the years, it seemed that the moment might finally be arriving. His longtime friend and former secretary of state, James A. Baker III, arrived at his Houston home on Friday morning to check on him. Mr. Bush suddenly grew alert, his eyes wide open. “Where are we going, Bake?” he asked. “We’re going to heaven,” Mr. Baker answered. “That’s where I want to go,” Mr. Bush said. Barely 13 hours later, Mr. Bush was dead. The former president died in his home in a gated community in Houston, surrounded by several friends, members of his family, doctors and a minister. As the end neared on Friday night, his son George W. Bush, the former president, who was at his home in Dallas, was put on the speaker phone to say goodbye. He told him that he had been a “wonderful dad” and that he loved him. The late President George H.W. Bush will lie in state in the U.S. Capitol Rotunda beginning with an arrival ceremony on Monday at 5:00 p.m. ET. The public is invited to pay their respects from Monday, December 3 at 7:30 p.m. ET until Wednesday, December 5 at 7:00 a.m. ET. Pure class. Rest in Peace, Mr. President.